I have found out that, for me , the best way to learn geography is to travel. Before coming to the Virgin Islands I really did not have a good sense of where they lie, or where other islands lie in conjunction to them. I learned that the US Virgin Islands and the British Virgin Islands (the BVI not the BVIs, that is considered redundant, like an ATM machine) are so close that you can sail back and forth between them easily. Sailing is line of sight and you are never out if sight of land. Someone once described cruising in the BVI is like cruising on training wheels. That suits me fine! 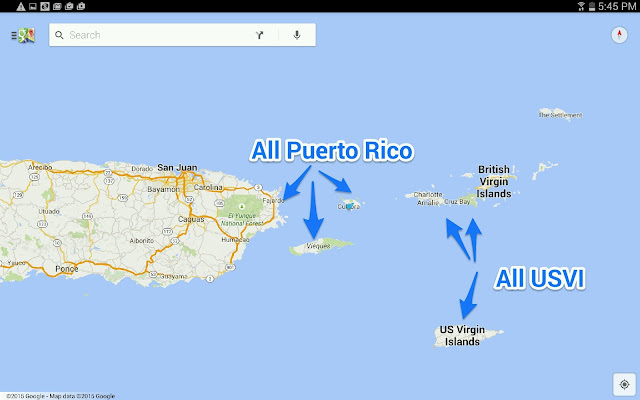 One of our objectives this summer was to sail from the USVI to Puerto Rico. It was not until I looked at a map that I realized how close together they are. I had a little trepidation in planning this leg of our trip, thinking that this would be the first time that we had had Rhapsody out of sight of land. We sailed across the north shore of USVI, and as we headed out, there was Culebra, the closest of the Puerto Rican Islands to USVI. We would not be out of sight of land after all! Geography lesson: Puerto Rico and USVI are within eyesight of each other. I like learning geography this way. We are now in Culebra. Back in the US which is good for phone calling and texting. No roaming or foreign charges!